Greetings again from the darkness. Our food supply and sources have become a deserved focal point of interest over the past few years, and director Christopher Quinn brings the 2009 best- selling book by Jonathan Safran Foer to the big screen to ensure we are paying attention. What began as a project looking at how animals were raised to fulfill the demand for edible meat, evolved into an analysis of traditional farming methods versus today’s prevalent factory/big corporation farming. We learn that the growing demand for affordable and convenient food in the 1970’s really kicked off the factory farming industry, and now it’s roughly 99% of the market. Only 1% of farmers resisted and survived (as farmers). “We eat meat not because of how it’s produced, but in spite of it.” Consumers demand delicious, affordable and convenient food, and the film looks at beef, chicken, turkey, pigs and dairy. We are told that factory farming began accidentally thanks to an overshipment of baby chicks several decades ago. Farming and our food supply haven’t been the same since. There is some rare behind-the-scenes footage from factory farms that is difficult to watch. Narrator and Producer (Oscar winning actress) Natalie Portman talks us through the disgusting “pink lagoons” of hog poop, as well as how the raising of animals for food is said to be responsible for up to half of climate change, and for having a significantly negative impact on air pollution and water quality. Of course most people, when asked, are against animal abuse and geological degradation so what goes on “inside” the barns remains confidential and secure. Going behind the doors of Confined Animal Feeding Operations, we witness conditions and actions that we would prefer not to see. We are informed that 80% of the anti-biotics being produced go towards farm factory animals, and the goal is to modify normal growth size and speed by 4 times. With this approach comes increased risk of pandemics, superbugs, and flu viruses. That’s our tradeoff for the delicious, affordable and convenient demands. The USDA comes under attack here as well. The agency is accused of silencing the whistleblowers who are doing the job the agency was created to do. They are now ‘protecting the fox, not the hen house’. This is all tracked back to politics and money from the big corporations affiliated with or benefitting from factory farming. Some old clips of Col Harland Sanders (of KFC fame) proves even he was concerned about this many years ago. Emotion comes into play here as the connection of traditional farmers to their animals is contrasted to the mass production of farm factories. Industry secrecy and protection is presented as a red flag, and the independent farmers are shown as good guys while the giant corporations remain faceless and (mostly) nameless. Only towards the end of the film do we gain some insight into the research being conducted on meat replication through plant-based systems. It’s brilliantly compared to the early days of “gas light substitute” as a name for Edison’s electricity. We are told that India and China now combine to total almost 3 billion people, and their diets are trending towards that of the U.S. – leading to more pressure for faster and cheaper food. 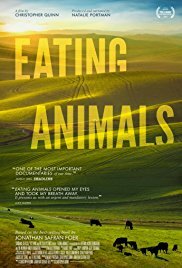 Traditional farming isn’t even taught in school these days, and the film barely touches on the always on-going debate between “humanely” raising animals for food vs. veganism. The film succeeds in showing us the problems, but doesn’t offer much in the way of solutions or even a better way … although it’s clear one is needed. This entry was posted on Monday, June 18th, 2018 at 9:34 pm and is filed under Documentary. You can follow any responses to this entry through the RSS 2.0 feed. You can leave a response, or trackback from your own site.